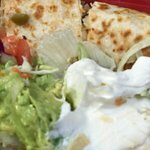 Enchiladas Del Mar - Fantastic!Everyone enjoyed their orders from fajitas to chimichanga de pollo.My favorite meal is the mixed fajitas (shrimp, chicken and steak) DELICIOUS! 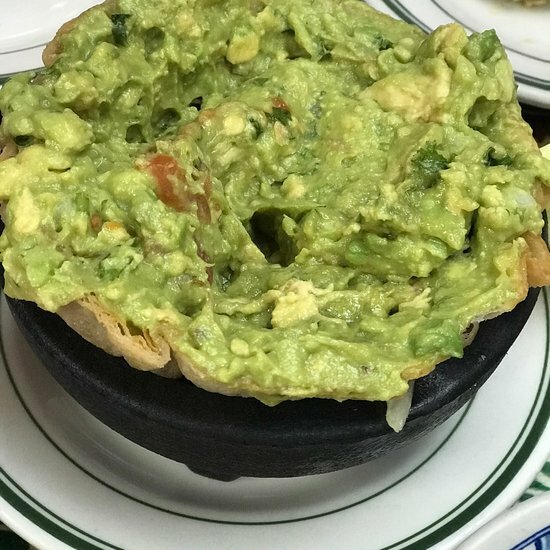 All Brunch items include Fresh Fruit in Season, Traditional Mexican Buñuelos, and California Champagne with Our Compliments. Frijoles de la Olla or Frijoles Negros may be substituted for regular beans. Corn tortillas filled and rolled with avocado and sautéed artichoke hearts, then topped with roasted tomatillo sauce and served on a bed of sautéed spinach. Served with Mexican style rice and black beans sprinkled with Mexican Cotija Cheese. Shredded beef sautéed with tomatoes, onions, bell pepper, and mixed with scrambled eggs. Served with Mexican-style rice and beans. Flour tortilla filled with scrambled eggs, onions, tomatoes, mildly spicy chorizo and cheeses, then grilled and cut into small squares. Complemented with guacamole and sour cream. Soft corn tortilla topped with two fried eggs and then covered with creamy sauce of Jack and Cheddar cheeses. Smothered with melted cheeses, and then topped again with sour cream and sliced avocados. Served with Mexican-style rice and beans. Corn tortillas filled and rolled with shredded chicken, then covered with a traditional red Mole Poblano sauce made of ancho and pasilla chiles, sesame seeds and peanuts. Sprinkled with Cotija cheese and garnished wih red onions. Served with Mexican-style rice and beans. Chunks of chicken breast mixed with sautéed shrimp and genuine crab meat, onions and tomatoes, and blended with special herbs and wine. Topped with melted cheeses, diced avocados and tomatoes. Served with Mexican-style rice. Omelette filled with sautéed shrimp and genuine crab and then enhanced with marinated onions, tomatoes and bell peppers, covered with relleno sauce and melted cheeses. Complemented with guacamole and sour cream. 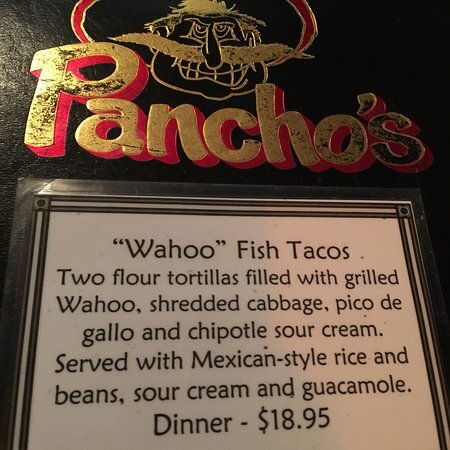 Served with Pancho's special green rice and black beans. 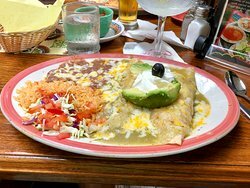 Thin charbroiled flat iron steak served with a cheese enchilada, guacamole, sour cream, pico de gallo and Mexican-style rice and beans. Brought to your table in a hot skillet! Chicken and tortilla strips simmered in fresh Tomatillo sauce, and then enriched with grated cheeses and sour cream. Baked in the oven and served with black beans sprinkled with Mexican Cotija cheese. 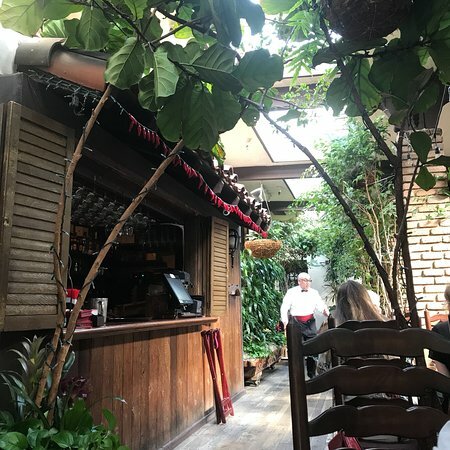 Marinated strips of flat iron steak, breast of chicken or succulent shrimp grilled with onions, mushrooms, tomatoes, bell peppers and spices, and served sizzling at your table. Complemented with salsa bandera, guacamole and sour cream. Served with Mexican-style rice and beans and hot tortillas. 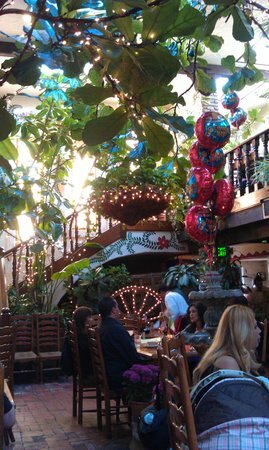 Authentic Mexican cuisine, award-winning margaritas, world-class service and nightly entertainment. The service here is amazing!!!!!!! The decor of this place is lovely and well designed for privacy. The servers were professional and not intrusive. 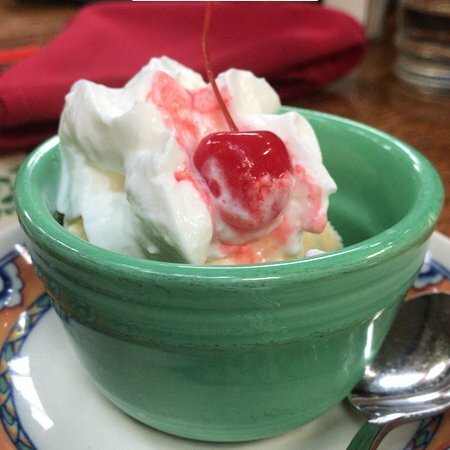 Food was amazing and you must try the tres leche cake! Had dinner with co-workers while in town for business. Great ambience, love the staff and wonderful food. Large portions, couldn’t finish our meals. 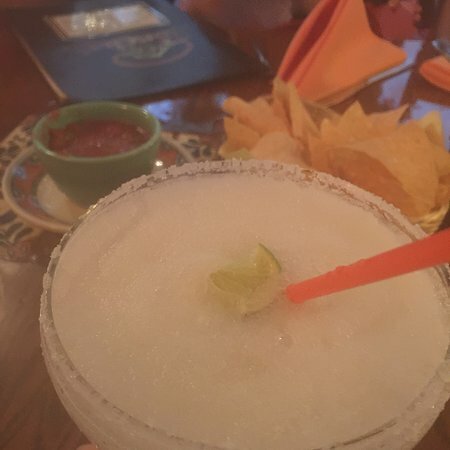 Enjoyed margaritas as well. 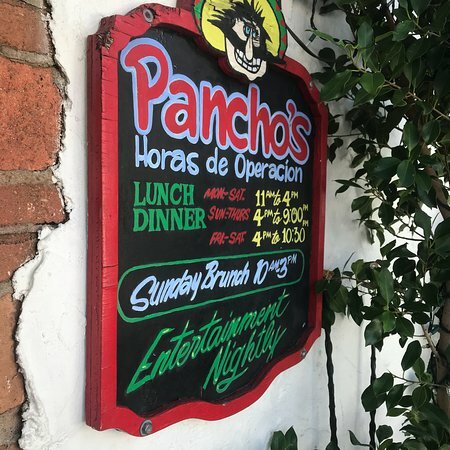 My team had a nice business dinner at Pancho's. The staff was very accommodating and pleasant. The food was really good. The atmosphere is very unique to say the least. I highly recommend this Mexican restaurant. My favourite Mexican spot period. 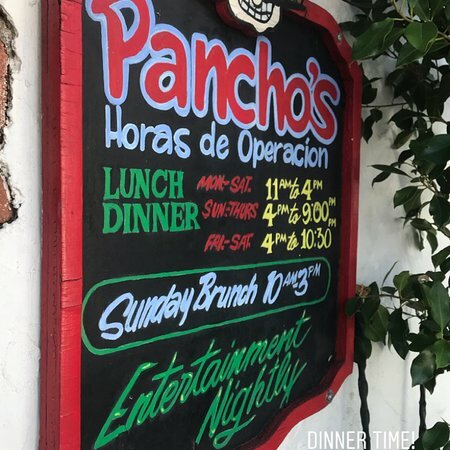 Get quick answers from Pancho's Restaurant staff and past visitors.